Let Québec City charm you! The very name Québec conjures up images of easy living, historical riches, world heritage treasures and incomparable tourist appeal. Québec City's topology is one-of-a-kind. The city stretches out from the shores of the St. Lawrence River, one of the largest rivers in the world. It extends north as far as the foothills of the Laurentians, the oldest mountain range on Earth, and east as far as Montmorency Falls. To the west, it reaches beyond the bridges that link the city to the south shore, past Jacques-Cartier beach and onto the municipalities of Saint-Augustin-de-Desmaures and Sainte-Catherine-de-la-Jacques-Cartier. In September 1535, Jacques Cartier dropped anchor at the mouth of a river he named Sainte-Croix (known as the Saint-Charles River in Québec City, today). He was exploring this northern part of the continent on behalf of the King of France, François I. The captain from Saint-Malo had a fort constructed out of wooden posts. Cartier returned to found a colony in 1541 under the orders of lieutenant general Jean-François de La Rocque de Roberval. He arrived in Stadacona in August with five ships and elected to settle at the mouth of a river that would later be called Cap-Rouge. In June 1543, the colonists returned home, ending France's first attempt to settle in North America. In July 1608, Samuel de Champlain came ashore to a place called Québec. He came at the request of Pierre Dugua, Sieur de Mons and holder of a trading monopoly to set up a fur trading post. The location seemed ideal. From the top of the promontory (Cape Diamond) it was easy to keep watch over the St. Lawrence and control traffic on the river, which was only a kilometre wide at the point. The word “Kebek” was in fact the Algonquin word for "narrows" or "where the river narrows." 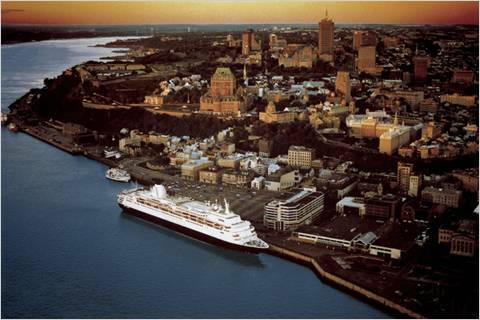 In addition to its strategic value, the point at Québec has a natural harbor and was already a popular gathering place for natives. Click here for a printable map of Québec City with recommended nearby eateries and hotels.